A few years ago, entrepreneur Dave Easterling brought back the beloved Falls City Beer brand; on May 10, Apocalypse Brew Works in Clifton unveiled Oertel’s 1912, a dark cream beer based on a recipe from Louisville-based Oertel Brewing Company dating to 1912. Local home brewer Jeff Faith is about to finish off Louisville’s Holy Trinity of brewing by brewing Fehr’s X/L, a pre-Prohibition lager based on recipe elements used by the Frank Fehr Brewing Company sometime after the turn of the 20th Century. Many have forgotten – or never knew to begin with – that Louisville was once a top brewing city, ripe with breweries that competed with regional brewing hubs like St. Louis, Milwaukee and Indianapolis. But just about anyone can name the Big Three – Fehr’s, Falls City and Oertel’s – because their grandparents or parents either drank one of the beers exclusively or actually worked at one of the breweries during the 1940s and ’50s. Possibly even both. Faith said the revival of Falls City is what sparked his interest. He also found evidence that two others had tried to trademark the name, one of those being Bluegrass Brewing Company, which actually brewed a beer called Fehr’s Darby Ale more than a decade ago. Faith had also contacted Hudepohl-Schoenling Brewing Company, which had brewed Fehr’s X/L for a time after the Fehr’s Louisville brewery closed in 1964. But the current owners had no idea who owned the name. However, last year the name became available, and Faith pounced. But there was just one problem: He made a mistake in his paperwork which the other applicants had also made, dealing with the Fehr surname. Faith quickly corrected the issue, re-submitted his application, and now the brand is his. In fact, he has been busy handing out Fehr’s T-shirts and stickers, as well as making tap handles for when the new Fehr’s X/L (which traditionally stood for “extra lager”) becomes available in bars and restaurants around Louisville. The recipe, which Faith derived from information he found in the 1995 book “Louisville Breweries: A History of the Brewing Industry in Louisville; Kentucky; New Albany and Jeffersonville; Indiana,” by Peter Guetig and Conrad Selle. Faith said a recipe description in the book calls for a pound and a half of hops per barrel. 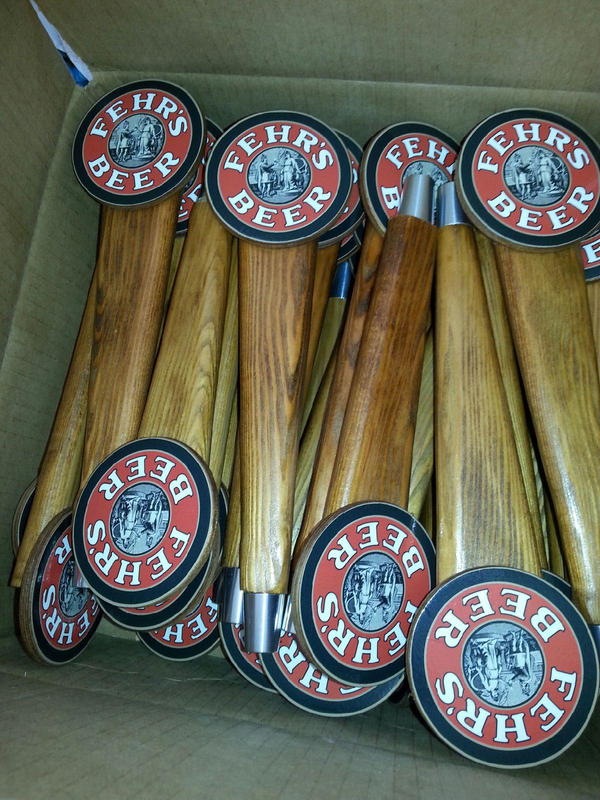 Fehr’s tap handles, ready for action. Photo courtesy of Jeff Faith. For those wondering what this classic Louisville beer may have tasted like, Faith is excited to share that it is a very accessible, drinkable beer. And while the Frank Fehr Brewery produced a number of different styles, the Fehr’s X/L was arguably the most popular. Now it’s a matter of finding the right distributor, Faith says. His margin will be minimal regardless, but he wants to keep the beer’s price point down. If he can reach an agreement soon for local distribution, he feels Fehr’s X/L could conceivably be on tap around town by late summer. BBC is going to brew the lager on contract, at least for starters. 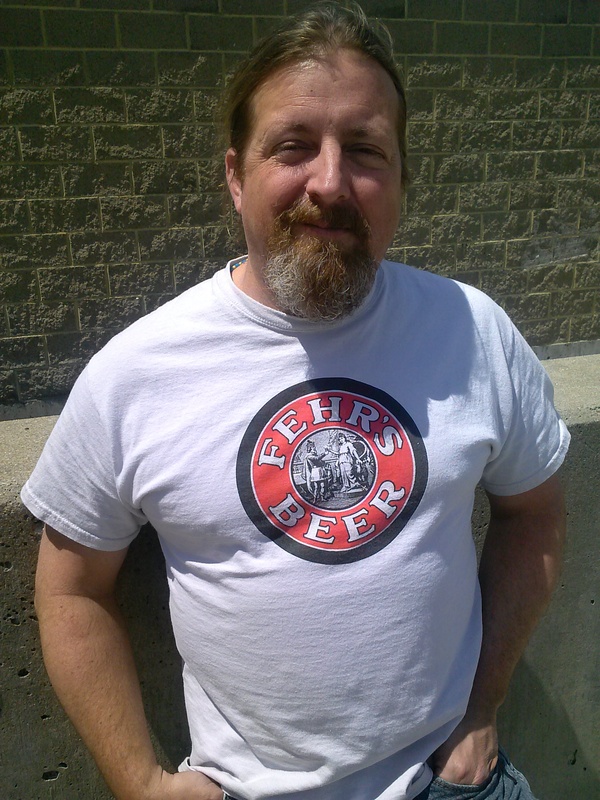 Meanwhile, keep your eyes peeled for Fehr’s Beer shirts and stickers making appearances around town; Faith says his shirts garner a lot of attention – people get excited to learn a classic Louisville beer is making its way back. But when it comes right down to it, it’s really about staying true to a classic Louisville beer.